A chronic gap of Siemens in manufacturing smartphones became a reason for releasing SK65 model that is supposed to replace such models in some kind and attract the attention of business users. 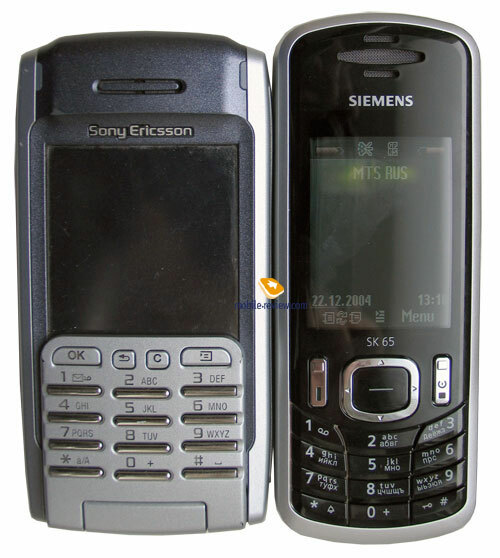 Smartphone history for Siemens lasts for several years only and Andromeda (or Siemens SX45) was the first model. Even by the release time the model had gone outdated since the handheld taken as a base was popular only in the be ginning of the development and was replaced by more interesting devices in a year. The result of a long silence turned out in SX1 that was supposed not only for business users but to play a role in a fashion segment. In the rush for two rabbits the company lost its business users since typing in texts was too uncomfortable. The device was popular among the youth and that was the great fall of the price that told upon and made SX1 one of the most available in its class. The device didn't suit the target group. And if the business audience loss was caused by the bad ergonomics the fashion one found the price too little. The company planned to announce SX2 in the end of the summer 2004 but hardware problems of the previous device were unsolvable. The release of the renewed version was put off till the summer 2005. Now that's impossible to say Siemens will be a powerful player in the smartphone market since all it can offer is the design and addition of some functions. Unfortunately, that's now enough for the device to become popular and prove itself in the market. Due to the absence of any solutions for the segment the company decided to provide some kind of a replacement or a substitute. 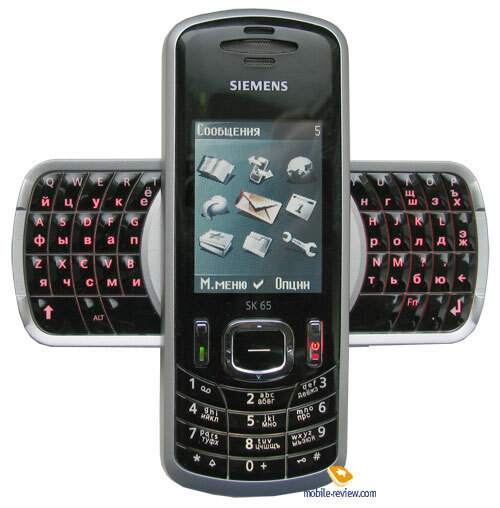 SK65 based on Siemens S65 without a camera and a memory card connector is equipped with a QWERTY-keypad. The company decided the keypad would make the device interesting for some business users automatically. For those worshipers of Siemens that start looking at the devices by other manufacturers due to the absence of any smartphone solutions by the company. That's curious the reason of not manufacturing a real smartphone was hidden with some rhetorical phrases sounded on a presentation on the 2 of August in London. Lothar Pauly on of the directors in Siemens Mobile and later a president of Siemens Com told the camera is not demanded by business audience. And the second announced reason was the strictness of the security rules that now forbid carrying in the phones equipped with integrated cameras. At CeBIT Lothar Pauly and Rudi Lamprecht (one of the directors of Siemens Mobile for that moment) told Siemens S65 was an excellent business solution equipped with a 1.3 megapixel camera allowing not only taking photos but also shooting video. The fact the device is targeted on a business audience and is created for "successful professionals" was stressed especially. Thus we are left thinking when the top-managers told the truth. But this is a little stroke showing how the company manipulates the information and the way of representing it. 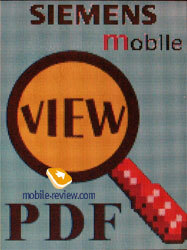 Rival phones by other manufacturers appeared earlier and were not very popular among users. Just remember Nokia 6800, Nokia 6820, Motorola A630. The presence of a QWERTY-keypad while the smartphone or communicator capabilities are absent do not attract users. The company didn't take this experience in consideration and counted on the design again. The x 2 type (cross to type) opening mechanism became a raisin of the device. 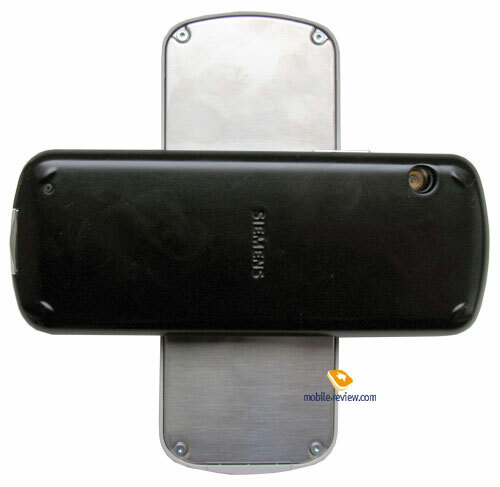 The phone is a usual slider in appearance but it's opened in a sideline and thus the phone turns into a cross and the keypad is placed in two sides of the screen. The solution is interesting but doesn't make the size any less. Even making it bigger. The phone has the dimensions of 120x47x22 mm and to compare S65 that may not be considered a small model is 109x48x18 mm in size. The weight of the device also grew 144 grams against 98 for S65. To compare a fully functional communicator with a QWERTY-keypad and many capabilities Nokia 9300 weights 167 grams (23 grams more than SK65 and 11 mm longer). Siemens SK65 is greatly different from similar solutions by other manufacturers in some way. That's clear the device is hard to carry in a shirt pocket permanently but it's pretty well to put in a bag or fix on a waist. The growth of the weight is explained with the presence of a metallic panel protecting the back of the keypad. The device is impossible to open with one hand and thus you'll have to hold it in both. Opening is possible only anticlockwise and that is unusual for the beginning. The backlighting is bright red and the characters of two languages are seen pretty well. The backlighting is activated automatically by opening the device or by pressing and then holding the Fn button. The way it works may be indicated in settings. The size of the buttons is average and they touch each other but not make any problems while typing. The buttons placed close to the upper part of the device make some extra problems and hands touch the body while typing and that disturbs sometimes. The test on a typing speed by different users (20 people acquainted with the device differently) showed that SK65 has no any advantages over the earlier announced models. 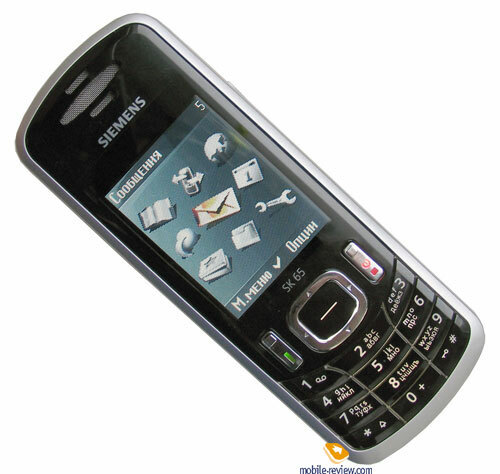 The typing speed is similar to such models as Nokia 6800, 6820, Motorola A630. The plastic used in the model is glossy and indicates fingerprints well. A usual keypad is quite acceptable and offers a standard set of functions. Keypad backlighting is white and the characters in a localized version (two languages) are quite small. Soft-keys are combined with a Call/End call button. Sometimes an unnecessary part of the button is pressed. A navi button is 4D with an OK button integrated. The battery hidden behind a back panel is 700 mAh Li-Ion. Average working time is 3 days in case of 30-35 minutes of talks and up to 20 minutes of using other functions. And here we see almost a complete similarity to Siemens S65. 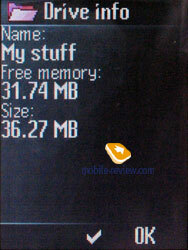 The device is equipped with 36 MB of memory available to a user and the manufacturer announces a total number of 64 MB. But even having erased all the preset applications, pictures, melodies you won't get this amount of free memory. A number of Java applications was offered for a business solution (they work on S65 and other devices as well). 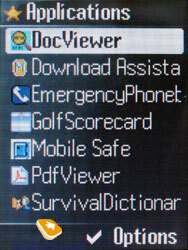 First, that is DocViewer that allows viewing (not editing) MS Office documents. As it follows from the name PDF Viewer deals with PDF files and the loading speed for small files is acceptable but for those files several MB in size the speed is minimal. 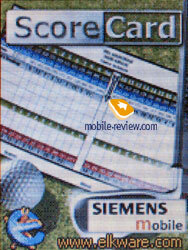 Golf Scorecard will gladden those who play golf seriously and often. We won't describe standard capabilities of SK65 since they are similar to ones corresponding in S65 starting with the screen and ending with the menu and software. I'd recommend to read a corresponding review. The device rouses no cavils in the quality of connection and is similar to S65. The price for Siemens Sk65 is about 450 USD now and that is not right. The maximum price of a similar device may get up to 300 USD not more. The device is a niche one with a poor ergonomics. I think those ones who needed a similar device have already bought Nokia 6800/6820. And to compareNokia 6820 costs about 260 USD but loses due to the general functionality and out-of-date screen. 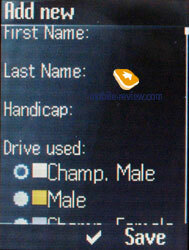 At the same time the text input capabilities and connectivity possibilities are comparable. The first sales weeks indicated a low interest to the model. Even the most convinced worshipers of the brand think of waiting for something else after the first look at SK65. As for me, Siemens SK65 is a truly weak model that makes no sense due to the presence of S65 (about 300 USD).